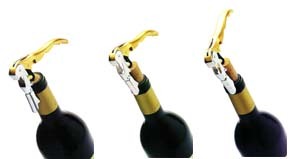 The Pulltap's hinged lever corkscrew is considered the most popular wine waiter corkscrew in the world. Restaurant personnel prefer them, thanks to the ergonomic handle and patented hinged lever which gives two positions to raise a cork. With this corkscrew you never worry about breaking off a cork inside a bottle. To use, just screw the five turn teflon coated worm into the cork, place the lever on the edge of the bottle in the top position, and raise the handle so that the cork comes up about an inch. Then lower the handle so that the lower part of the hinged lever is on the bottle lip, raise the handle again, and the cork comes completely out. Each Pulltap's comes with a serrated edge capsule cutting blade and a crown bottle cap remover. The solid steel construction means it will last many times longer than other wine waiter corkscrews, while its ergonomic handle fits both the right and left hand. Pulltap's offers two complete lines. The Promotional Pulltap's is an inexpensive means of promoting your company or product line. Available in a black, white, burgundy, navy blue, dark green, or nickle plate silver handle, they can all be personalized by screen printing on the handle. Minimum quantity: 480 pieces. The Pulltap's Gift line offers a high end assortment of corkscrews with special handle finishes for key accounts and special promotions. These include the Colour line (Black Zinfandel, Blue Cabernet, Red Malvasia, Green Chianti), the Classic line of metallic finishes (Silver Riesling, Pearl Sauvignon, Bronze Jerez, Graphite Merlot), and the Elite Gold Chardonnay. All Gift Pulltap's can be laser personalized on the handle and come in individual cardboard boxes or special retail gift packaging. The Pulltap's is imported directly from the manufacturer, with all personalization done at the factory. Pre-production samples are available on demand. When you want the best, you want a Pulltap's.